MultiBrief: White rice vs. brown rice: Which is a better choice? 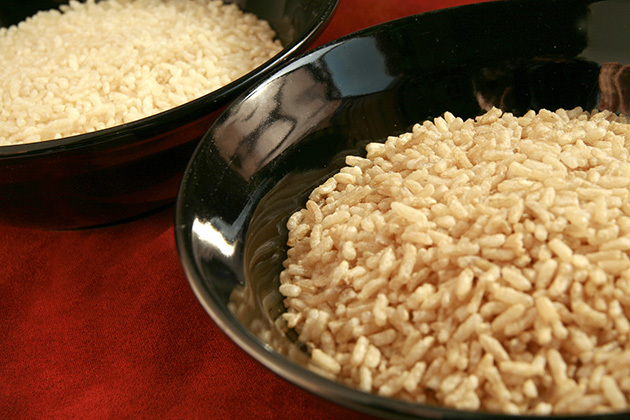 White rice vs. brown rice: Which is a better choice? When it comes to bodybuilding, physical exercise or just recreational weightlifting, it is quite easy to hear some advice, stick to it and then just watch as all of your efforts to shape your body go down the drain. We've all heard myths like, "If you don’t run at least three miles a day, you will never lose weight" or "I don't want to lift weights, it will make me look all big and bulky." Like these false rumors, there is another one that has become quite popular these days. Obviously, someone has decided to tell all these good people in the gym that brown rice is a much better choice than white rice for people who are working out. In this article, we are going to find out the truth. Why do people who exercise prefer brown rice? Some people say brown rice is full of protein and that, unlike white rice, it will quickly replenish the strength in your muscles to give you all the energy you need to hit the gym again tomorrow. Other people will say, "Nah, it's just a myth, man." The thing is, both of these claims are wrong. Brown rice is healthy, that much is true, but when it comes to protein it's not as effective as you hear. That doesn't mean that you should avoid brown rice, it just means you should not put too much faith in it. The good things about brown rice — especially when it comes to people who are working out — is that it does contain useful things that could be beneficial for your body. However, it should not be your primary source of energy. Brown rice's strength lies in some other areas, actually. First of all, brown rice contains about the same amount of protein as white rice. But brown rice contains fiber, carbohydrates (in reasonable doses), selenium, vitamin B, iron and a significant number of calories. So if I work out, should I consume brown rice? Since it contains a lot of things that your body could find useful, the answer is yes. Should brown rice be your primary source of necessary nutrients? Definitely not. When it comes to protein, which is one of the most important things that your body needs when you work out, brown rice is mediocre at best. Protein comes in two forms, complete and incomplete proteins. Complete proteins can be found in red meat, fish, some vegetables or supplements, and they contain all nine essential amino acids that your body needs. Incomplete proteins are missing one or more of those amino acids, which means that they cannot fully satisfy your body after a workout. And brown rice is an incomplete protein. This means it's not bad if you occasionally consume it, but if you rely on brown rice to keep your body well-supplied with protein during a workout, you will be disappointed. White rice has always been a popular solution for bodybuilders. Not many will say white rice is "useless" or "unhealthy," but some favor brown rice and think the consumption of white rice is an "obsolete" habit. Thing is, these people are wrong. True, there are some other plants that could be even better for consumption — millet, quinoa, etc. — but if you want to stick with tried-and-true methods, you will go for a good old cup of white rice. White rice has everything that your body needs to "survive" the exercise. White rice contains solid amounts of protein, and it only lacks one amino acid (lysine) to form a complete protein. This means it contains eight out of nine amino acids. Also, white rice contains the sufficient amount of carbohydrates that your body needs in order to build up some muscle. It is important not to confuse a number of carbs (and the effectiveness of carbs) in white rice to those of a hamburger or a hot dog. If you don't believe this, then take a look at a study that was performed a few years ago. Researchers examined the diets of two groups. The first group consumed traditional Japanese dishes (that were mostly made of rice), while other group consumed a traditional Western diet. Both types of food contained the same amount of calories, but the people who ate traditional Japanese food lost weight and improved their insulin sensitivity, while those who consumed Western food worsened their metabolic profile. This proved two things. First, it is one thing to consume natural carbs from plants, and completely another thing when you affect the shape and size of these substances in your food before consuming them. Second, it proves again that white rice is simply the ultimate source of natural carbs and protein. Conclusion: Which is the right choice? If you are into exercising, weightlifting and bodybuilding, then you go for the white rice. It contains a larger amount of beneficial substances than brown rice, plus it is available everywhere and easy to prepare. White rice also has the benefits of some other products and substances that could boost your training but harm your testosterone levels. You should know that brown rice contains phytic acid, an antinutrient that binds minerals in the digestive tract, making them the less available to our bodies. This doesn't mean you should skip brown rice or remove it from your diet. This means it is not recommended for those in training, and it shouldn't be your primary source of nutrients. Brown rice has its uses if consumed occasionally. When it comes to training, stick to white rice. Matiss Stein is the CEO and founder of TopTestosteroneBoosters.org. A 21-year-old fitness enthusiast, Matiss is always looking for new ways to improve his body. He is from Latvia and studies in Denmark, but he is currently participating in a student exchange program in Spain. Matiss is interested in business, marketing, advertising and sales. He is a commercially focused, innovative and energizing character with strengths in relationship building and communication skills.